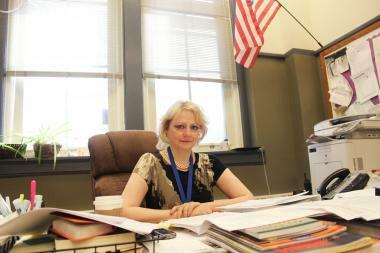 Senn High School's former principal was removed from the school in July before resigning amid a scandal. EDGEWATER — Six months after Senn High School's former principal Susan Lofton was ousted from her leadership post, a Chicago Public Schools watchdog has finally revealed at least part of the reason why. Lofton and two other Senn employees conspired to keep 15 special needs students out of the school's fine arts program, according to an annual report from CPS Inspector General Nicholas Schuler. In July, Lofton was escorted from the building at 5900 N. Glenwood Ave. by CPS officials. Days later, she resigned. Lofton had often been credited with turning the school around and raising its academic status while also lowering its problems with student violence. But some of the measures that helped to boost Senn and Lofton's images may have also been falsified, according to the report. The Sun-Times originally reported that Lofton had been scheming to lower admission test scores from special education students in an effort to block them from Senn's Magnet Fine and Performing Arts Program. CPS officials would not confirm the allegations, but the report says that Lofton met with two other staffers in February to review a list of students determined to be eligible for admission into the magnet program. Lofton allegedly asked the case manager look up student information in a CPS database, using someone else's credentials, and used that information to identify 15 students on the list who qualified as special education learners "whom she did not want to be offered enrollment." Lofton told the coordinator to lower those admission scores to make it appear as if the students were not eligible. According to the report, the coordinator followed Lofton's request and changed the scores. Soon after, parents of some of those students began to question the school why their student was being denied enrollment when they believed their student had done well on entrance exams. "In an apparent attempt to placate those parents — and to probably minimize the fallout — the coordinator admitted 4 of the 15 students," the report said. The report also said that throughout the investigation, Lofton repeatedly tried to find out what witnesses told investigators. Several witnesses said "the principal was trying to intimidate them as to prevent anyone from implicating her." Three former teachers are also suing the former Senn principal, and detail false accusations and intimidation from Lofton. While Lofton resigned in lieu of being fired, the report states the coordinator and case manager she worked with to keep special needs students out recieved "additional training." After her removal, Lofton was temporarily replaced by Assistant Principal Carter Carey, then later by interim Principal Mary Beck. Lofton did not immediately respond to request for comment.